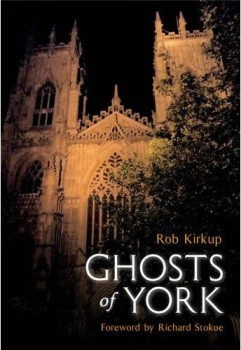 Ghosts of York, a brand new book by ghost-hunter extraordinaire, Rob Kirkup, chronicles the travels of 5 friends as they visit 10 of York’s most haunted locations. Disclosure: Yes, I was one of the 5. And yes, I wrote the foreword. But despite these two facts, I can unbiasedly confirm that this is a fantastic book that you should swap your hard-earned cash for! With all the profits going to Cancer Research UK, there’s not a penny in it for Rob, me or the other three, but you will be helping to find a cure for cancer, while also picking up a great read. As I mention in the Foreword, when you put 5 people together for a period of time, even if they are friends, you get interesting dynamics appearing. Personalities clash, or harmonise. Traits become exaggerated or diluted, or flip and ebb. But when you put 5 people in a situation of incredible tension, like actively seeking contact with the other side in places where there are plentiful reports of paranormal activity, everything becomes amplified even further. You can read Ghosts of York as an anthropological experiment or you can just enjoy the tale. You can choose to believe or be skeptical. But let me explain something: I am a computer guy – I like logic. I am a problem solver – I thrive on reasoning and rationalisation. But on this quest for the paranormal I stood in places where hundred of people lost their lives. I stood at windows where people decided to end their torturous lives and leap from. I’ve experienced things that logic and reason has no explanation for. Grab your copy from Amazon today and find out what happened when the Facebook generation came face to face with the Ghosts of York.